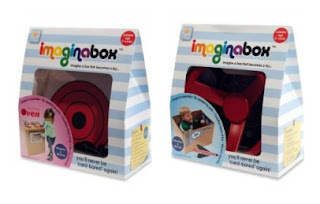 I first saw the imaginabox range in a boutique children's store in Melbourne (Australia) and instantly thought what a fabulous concept it was! 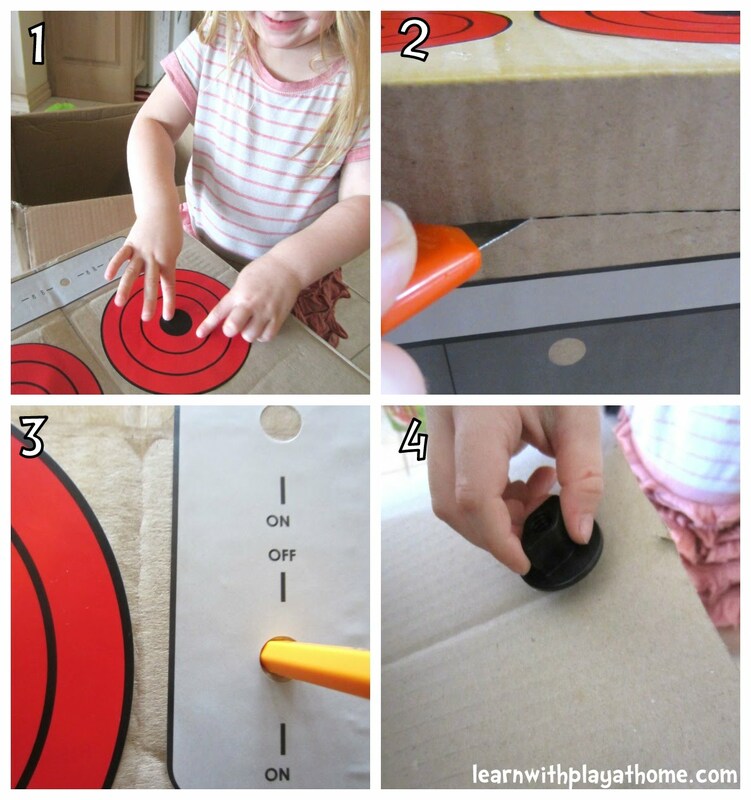 Cardboard boxes are loved by children everywhere and with the fabulous bright, reusable stickers and fun accessories that come with imaginabox, they can turn a simple object into a well loved toy, quickly, easily and with no mess. It is no wonder that director of On the Gro (and "Mumpreneur") Melanie has won not only the South Australian Young Entrepreneur of the Year Award but other awards including winning the mychildmagazine.com 2012 Excellence Award for Best new Product! 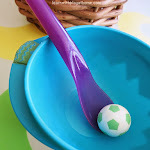 I jumped at the chance to review some of their products because anything that can help develop and stimulate children's imagination leading on to role play and language development gets the thumbs-up from me! As you can see, my daughter was rather impressed when they arrived! We chose the oven and an aeroplane to try. We loved how the oven came with a couple of interchangeable stickers. Maddie was adamant on adding the cake first. As you can see in the pics, the cardboard box we used was a rather tatty one that had been stored under the house for some time and it was a little warped and textured. This meant that some of the stickers started peeling up at the edges as they didn't have a good clean, flat surface to adhere to properly. If you're using an old box and this happens, you can either stick down with a small amount of glue so as to allow the sticker to still be taken off, or just add a tiny bit of tape to the corner like I did. The warped nature of the box certainly didn't discourage Maddie from using it. We have a play kitchen at home already (actually, a couple) but none of them have seen any use since she's had this one to play with. Something about it being made from a box just makes it even more appealing and having the knobs that move just add to the fun! Maddie gave it the thumbs-up! Who cares about the tatty box when you have this in front of you! I'm not exactly sure where she went, but she was flying for ages! their choice of any 2 imaginabox products. 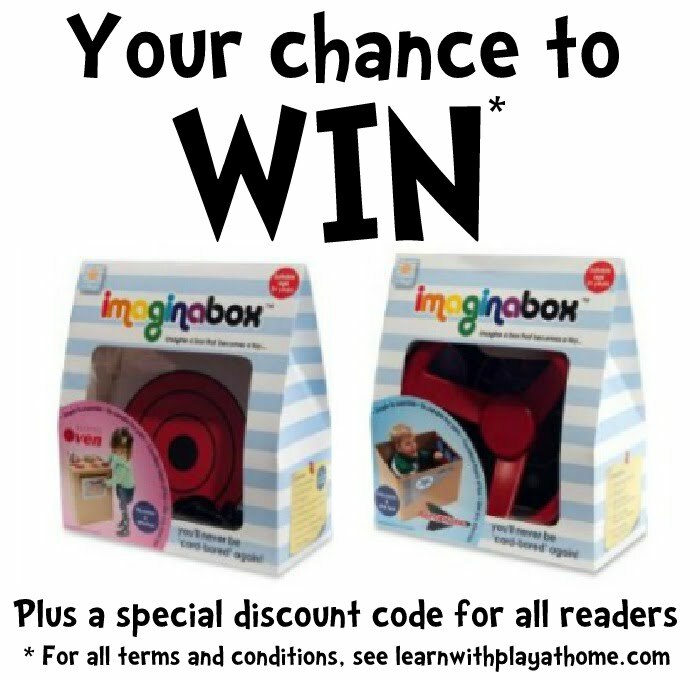 with the discount code "learnwithplay"
Step 2: Visit the On the Gro website and then leave a comment on this post here telling us Which 2 imaginabox products you'd choose and why? 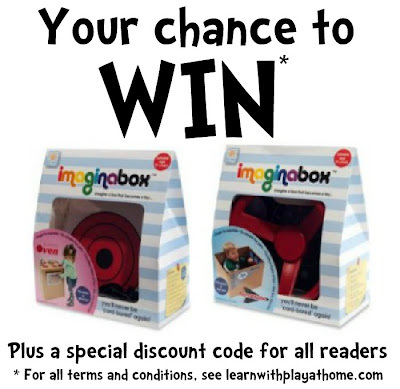 The most creative response will win their choice of any 2 imaginabox products. Thank you for your entries. We wish you could all win! so plenty of time to still get them at a discounted rate. 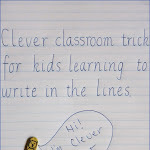 - Enter the discount code "learnwithplay" in the box provided at checkout to receive your 15% off. I hope this is right....i would choose the imaginabox oven and the imaginabox aeroplane because my kids are always trying to cook with me at all meal times in the kitchen and drive the car with my fiance. Wow whoever though up these is a genius! I'd choose the aeroplane and the oven for my 4 boys. My little ones took their first plane trip this year and they are now obsessed with planes! They also love to cook, and are always up on my bench pretending to mix something. The real oven however is out of bounds for pretend play, they'd love one they could use! So this would go down a treat on Christmas day when we have lots of spare boxes around. Great idea! I would choose the aeroplane imaginabox because my little girl, who is only 11 months old, loves sitting and sliding around in a box. I think the steering wheel would also be great to take on planes and in cars as a way of children keeping occupied when traveling. This is awesome!! Such a time saver, rather than painting and creating ourselves. My 2.5yr old is obsessed with trains, so the train and straps would be the best she could then choo choo all over the house. What an awesome product! And South Aussie too :) My daughter is obsessed with trains right now, she's be over the moon to play with the train kit. The aeroplane is also a favourite after our recent trip on a real aeroplane. Just think of the places we could go with those! These are so great! I would choose the oven as well - my son loves to play "pretend restaurant" and whips up all sorts of lovely imaginary concoctions! For the second one, it's a tough choice between the plane or the train, but I think we'd go with the aeroplane. So many hours of imaginative, creative play to be had. How wonderful! This is fantastic! 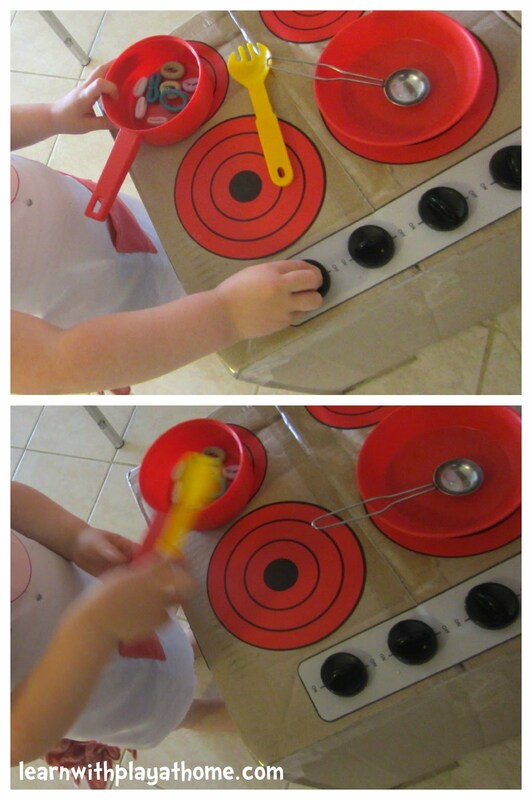 We have tried to make our own oven and trains heaps of times! This would make do much easier and encourage so much more play! Wow! I would like the car, train, and aeroplane - because with planes, trains, and automobiles, you can't go wrong! I would choose the car and the oven. My son loves cars, and he would have a great time pretending to cook meals. These are great products. what fun to play with imaginabox! Wow! I'd never heard of these - so much fun!!! I don't know which one my kids would like more - they are so adorable. My son would go nuts for the plane! We're in the process of moving house, and our new house is quite a bit smaller so I've had to cancel the kitchen set I'd wanted to get for Christmas - the oven set would be a perfect replacement! 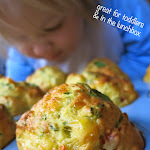 What wonderful 'toys', there's nothing like a child plus a box to foster creativity. My children are just getting more creative looking at the pictures, so here are their original answers: My youngest son would like the "Aeroplane to fly in the air. I will fly it in Mummy's room then into the kitchen." My eldest son would like to cook brussel sprouts and pancakes (Hopefully not to eat together!) on it and then garlic bread and pizza. 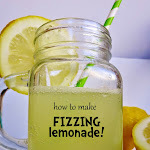 To win these from Imaginabox!! Your prizes are always amazing! Nice but u could just paint ur own. Look up Caine's Arcade on youtube + truly be inspire. Caine is an amazing 9 year old (now 10) inspiring people all over the world. Peace.